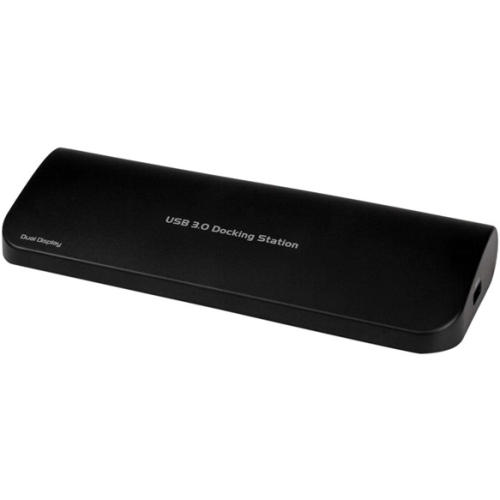 The USB3SDOCKHDV Dual Video Universal USB 3.0 Laptop Docking Station with Audio and Ethernet lets you add dual HD video outputs, as well as audio and Gigabit Ethernet connections to any notebook or UltrabookÂ�Â�â„¢ computer through a single USB 3.0 connection. This versatile USB 3.0 docking station features three external monitor outputs (HDMI, DVI-D and VGA) that can be used in either HDMI and DVI-D, or HDMI and VGA combinations to expand or mirror your desktop. Each video output supports HD video resolutions (2048x1156 max) and HD video playback for an ideal solution to expanding your notebook's video capability. An all-in-one mobile solution, the universal docking station combines a USB 3.0 hub (backward compatible with USB 2.0/1.1), Gigabit Ethernet RJ45 and headphone and microphone audio connectors into a single universal port replicator, perfect for enhancing laptop connectivity for users who need to connect and manage multiple devices at home or at the office. Backed by a StarTech.com 2-year warranty and free lifetime technical support.